VIA ROMEN Guitar Duo was created by the founder and artistic director of the U.S.-based VIA ROMEN touring and recording ensemble, the Duo consists of the famous Gypsy 7-string guitar virtuoso, vocalist and dancer – Vadim Kolpakov, and virtuoso guitarist, composer, original ensemble member – Alex Gordez. 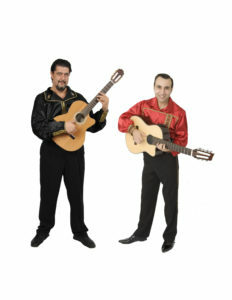 The Duo continue the tradition of the Romani (Gypsy) music and combines it with flamenco and other styles that makes it sound original and unique. They combine music from different parts of the world, including Spanish flamenco, Jewish klezmer, jazz, Latin rhythms and Romany (Gypsy). They have performed in many cities in North America as well as overseas. VIA REMEN Guitar Duo always gets a great response and standing ovations at their shows. Artistic director of the Via Romen ensemble, Vadim Kolpakov who is a virtuoso Russian-Romany (Gypsy) seven-string guitarist, dancer, and vocalist. He has performed extensively in Russia and abroad, including at Carnegie Hall and the Kremlin. He has also participated in numerous musical projects on Russian, American and European television and radio. Since the mid-1990s, he has been a member of the Russian-Romany group the Kolpakov Trio, and in 2004 he assembled his own group in the United States, Via Romen. His musical repertoire includes 19th-century Russian seven-string guitar, and Gypsy, classical, rap, pop and world music. In 2008 and 2009, Vadim participated in Madonna’s Sticky & Sweet world tour as a part of The Kolpakov Trio. Alex Gordez (six-string guitar, bass) is a virtuoso guitar player and composer. A seasoned musician, he has played countless festivals and venues across the country and around the world. After graduating in 1988 from Kiev’s prestigious Glier Music College, where he studied jazz performance, arranging and composition, Alex began performing jazz and world music on international concert tours. Upon moving to Israel in 1991, Alex became part of the acclaimed Gesher Theater Company. Four years later, he moved to the United States to co-found the ELM Collective, a group of veteran musicians who wrote and performed their own original music, blending eclectic world and jazz styles. Today, Alex serves as the co-director of Via Romen, a world-class ensemble that has impressed audiences both here in the US and abroad. His latest project, Via Romen Guitar Duo, features Alex alongside the revered Russian seven-string guitarist Vadim Kolpakov, who traveled and performed with Madonna on her past world tour. Recently, Alex was chosen to represent Kremona Guitars at the exclusive National Association of Music Merchants (NAMM) show which is regarded as the premier trade-show of the industry. Passionate about sharing his love of music, Alex also teaches guitar and music theory at his private home-studio in the heart of downtown Raleigh, NC.